It was part of a training practice during exercise Vigilant Shield 17-1. A cooperative NATO/NORAD exercise known as VIGILANT SHIELD 17, held on Jun. 15 to 16, 2017, allowed the NATO Combined Air Operations Centre (CAOC) at Uedem to conduct the handover of a simulated flight of strategic bomber assets with the North American Aerospace Defense Command (NORAD). The exercise involved US Air Force B-52 Bombers transiting from Europe to North America simulating a so-called track to be detected by NATO’s Integrated Air and Missile Defence System and NORAD’s air-defence system. 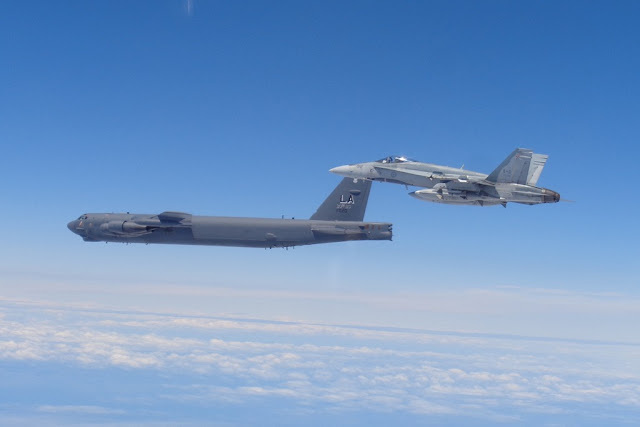 The bomber flight was constantly tracked by the CAOC, which alerted RCAF CF-18s presently stationed at Iceland on a NATO mission to intercept the track. The RCAF jets safely identified the B-52 more than 100 miles off the coast of Iceland. This exercise was closely planned between NORAD and NATO to ensure maximum training and integration opportunities and compliance with all national and international protocols and regulations. "This exercise provides an opportunity for NORAD forces to work with NATO, to train and ensure they are prepared for the critical mission of defending North America,” said Major-General Christian Drouin, Commander, 1 Canadian Air Division and the Canadian NORAD Region.